Need someone to update your current website or create a new website? We have customers come to us all the time saying they had a company design their website and now they need changes made. The only problem is the company that did the design has fallen off the planet. Or they want a ridiculous amount to make a seemingly simple change. Let our team help. 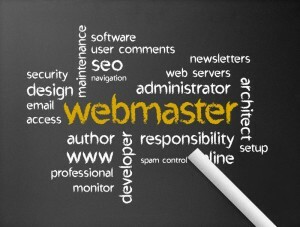 Our webmasters have years of experience and are able to make any changes you need made. We can update text on your site, add promotions, change images, redesign pages, add google analytics tracking code or anything else you need done. Webmaster services run $30 a hour. We’d be happy to give you a quote on what you need done just fill out the form below. With this service we do all the basic setup on a new website. We install wordpress, help you find a theme and install it. Then we set it up to have all the features you want for your website. For example setting up a slider, contact form and menu. So once we’re done we’ll show you how everything works then you’ll just need to add your pages. This service starts at $99. Fill out the form below for a quote. Don’t have the time or desire to do it yourself? We’ll do the full site design including all pages. The site will be created with easy management in mind. Full website design services start at $500 and it normally takes two to four weeks to complete the project. Fill out the form below for a quote.